Someone not too long ago mentioned to me that an upstart group of homosexual males were marching proudly on a Havana avenue, flying multicolored flags and accompanied by the daughter of General Raul Castro. She asked one of them if they knew who the UMAPs were. Surprised, he could only answer, smiling while he walked away, as if no one remembered them anymore. It has been more than 50 years and the many of these young men were not born yet, moreover, the victims of the Unidades de Ayuda de Producción (UMAP) are either very old or deceased. But I remember everything. I close my eyes and see an alert chubby solider punching a desk, telling me that the UMAPs do not mistreat anybody and that as a revolutionary, I must wholeheartedly support the Cuban Revolution. The UMAPs had an exact date in which they were created. The how, the why and the where in regard to their creation are also known. It is very possible that the UMAPs were known right before they were created as concentration camps, when the official media announced when the first people were rounded up in March/April of 1965. At the headquarters for the Artists and Writers Union of Cuba, many secretly expressed their disagreement, while others were afraid of being victims for the second wave. Thanks to some authors close to the country’s ruling class, it was known that Raul Castro head of the Revolutionary Armed Forces and Interior Minister Gen. Ramiro Valdes traveled to China and Bulgaria to help find a solution to deal with Cuban homosexuals, because they were considered to be a “problem” by Cuban officals. Raul traveled to Bulgaria where he met with the country’s leaders who assured him that there were no homosexuals in Sofia. Authorities there deported gay men to labor camps where they “turned” into real men or simply exterminated forever. “Forever”? Raul asked with intrigued. “Forever” replied the Bulgarians “We have cleansed Bulgaria of such social degenerates”. Upon returning to Cuba Raul phoned his college Ramiro Valdes who also brought great news from China. “Hit them”? asked Raul. “They were beaten during the confusion of the festivals and then thrown into the river” responded Valdes. “I know what we are going to do now. The Bulgarian model is the best method: we will turn them into soldiers either willingly or forcibly. We will conscript them into the Military Service after which they will emerge as real men”. Some statistics indicate that from 1965 to 1966 close to 35,000 inmates that also included religious people such as Jehovah’s Witnesses, dissidents but predominately homosexuals, were dispersed all over Camaguey province. 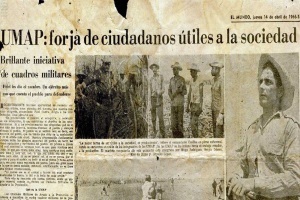 The Cuban regime tried disguising these policies as military training for national service. Even though the main goal of this sinister plan was not to kill these men but to forcibly eradicate the homosexuality (something as old as life itself) inside of them. Out of the 35,000 inmates, 500 homosexuals ended up under psychiatric treatments, 180 committed suicide and 70 were tortured to death. In 2011, Mariela Castro Espin, Raul’s daughter and the director of the National Center of Sexual Education (CENESEX) promised to investigate the horrors of the UMAPs. Despite this her pledge there hasn’t been any investigation since this pledged was announced 7 years ago. This is the ideal moment for General Raul Castro and Commander Valdes ask for forgiveness for their role in creating the UMAPs. Instead of receiving medals, honors, and titles, they should ask for forgiveness. As he leaves the presidency, this would be the ideal time for Raul Castro to apologize to the victims.